How do you know if you’re getting a good deal on that eighth of weed? It’s a matter of knowing what to look for and being familiar with prices in your area, whether that’s at legal pot shops or on the black market. We talked with a panel of experts—OK, a group of longtime recreational cannabis users—and came up with some pointers on how to get the best deal possible on weed. Unless you’re stuck buying buds from one guy, at one price, all of the time (and if so, maybe you oughta consider getting out more), you have options when it comes to spending your weed budget. The smart thing to do, obviously, is to stretch those dollars without sacrificing quality. Whether you’re in a legal state, buying at a storefront dispensary, or copping a bag from the dude down the street, it pays to know your dealer. Smoke with them, talk to them, ask questions in a friendly, casual way. It’s just common sense when buying anything, really. You should know the reputation of the place or person where you get your herb. For a lucky few who know a master grower, you can get fresh herb straight from the source and know the exact regimen under which it was grown. For everyone else, however, it’s not quite that easy. That’s some very solid advice, but in some legalization scenarios, smelling or trying the weed before you buy it just isn’t possible. In Washington state, for example, on-site consumption is prohibited and cannabis is sold in sealed containers, either plastic or glass, which prevents a whiff of what’s inside. While some shops have tried to ameliorate the “no smell” problem by offering sample buds one can sniff through a screen, it’s good to note that these quickly lose their terpenes and become unrepresentative. After knowing your source, perhaps the most important bit of knowledge when buying weed is knowing your strains. 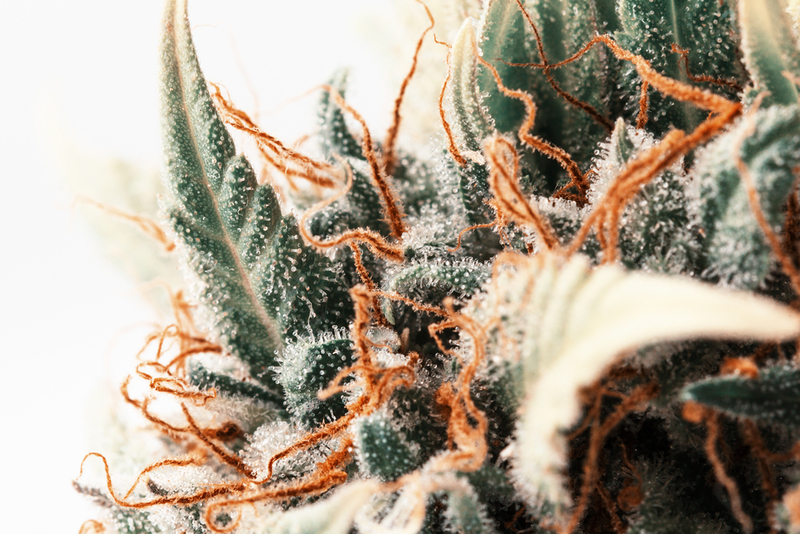 It’s particularly important to know the strains that work best for you, whether your priority is getting as high as possible or finding some medical relief. That can be a breeze in recreationally legal states. It’s quite doable with a physician’s authorization in medical marijuana states too. But it can be a challenge in states that don’t yet have official channels of distribution. Either way, our extensive strain database is a good starting point. By knowing what to look for, you can perform your own quality control on weed that is being offered for sale. Some things are just obvious: Avoid buying weed with any signs of mold or adulteration, for instance. But there are many other markers of quality too. Watch for moisture content. If weed is too damp, you’re paying for some water weight in addition to the cannabis. Properly cured cannabis flowers, according to those who attend to such matters, should be in the range of 63 to 67 percent humidity. Herb should be able to be broken up easily without crumbling or turning into dust. High-quality cannabis is usually quite sticky. This is due to the trichomes, which contain THC and other cannabinoids. The more glittery crystals on a bud, the better. It’s also not a bad idea if you’re getting weed from a dealer who doesn’t weigh it out in front of you to get one of these scales. If you’re buying weed in a legal marijuana store, you should understand the shelving system. 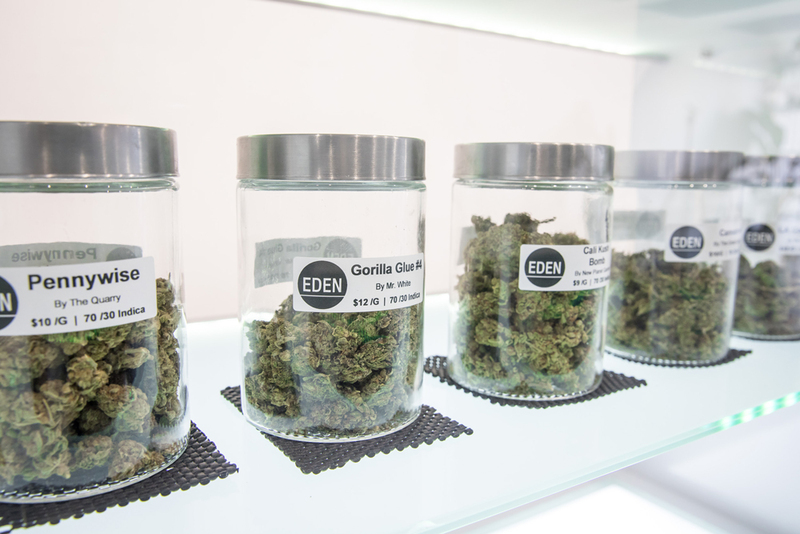 Dispensaries often divide their marijuana into three shelves: top, middle and bottom. Top shelf products are the highest in quality and in price. The bottom shelf often still has good weed, but it can be less potent buds, loosely trimmed flowers, or sugar leaf/trim. Check the lab numbers to gauge how good a deal you’re getting on bottom shelf weed; a great price on 20% THC buds isn’t as attractive on 12% THC weed. “Density, trichomes, color and shape are all factors in determining the quality of the bud,” offered Chris, who lives in North Carolina. “However, the way it was grown and the love and care put into it make up for a lot of the quality. And sometimes, you can’t tell any of that until you put a match to the end of it,” he said with a laugh. Sometimes the best deal for getting buzzed is not on flowers at all, it’s on some other kind of cannabis product. If you don’t live in a legal state, you can also make dabs pretty easily with this guide. When buying weed, it’s important to be aware of the prices in your area. That way, you can avoid some unscrupulous dealer taking advantage of you, or avoid just paying too much in a store. Weed prices fluctuate with the seasons, usually dipping around outdoor harvest time in the fall. Prices can vary widely even when buying weed of the same strain and even in a legal environment. Some upscale “luxury” pot shops will charge twice as much for the exact same strain, and they don’t seem to have much trouble finding affluent customers. If your budget isn’t quite that flexible, learn which shops offer the best deals; shop around. “Down here in Florida, this is difficult because of availability, or lack of it,” “JJ” told us. “So for a local to my town, a quarter-ounce runs $100, but I know someone in Miami, so I can pay $115 for a half. Even with that, sometimes when I ask the strain, it’s called ‘good’,” JJ said with a laugh. At the end of the day, whether you live in a legal state or not, the best way to get quality weed in bulk is usually just to grow it yourself. It’s not as much work as you would think, especially with this step-by-step guide.